I am so sorry this review is a month late! With the holidays and the start of this new year, my life has just been a little hectic to write a review that does this amazing book and series justice! But hopefully this will sing even an ounce of the praise that this epic fantasy series deserves, because this third installment was nothing short of a masterpiece. Also, I’m going to try to write this review spoiler free, but I am very sorry if I accidentally say a little something that could perhaps be considered a spoiler. I mean, these three books are massive, and this story is so heavy, I apologize in advance if I slip up. I know I won’t say anything major, but please use caution, or maybe pass on my review, if you would like to start The Way of Kings completely blind. And I also think it is important to note that it is very important to read the novella, Edgedancer, before reading Oathbringer, too! This is a huge scale, epic fantasy, that is massive not only in size, but in content. Roshar is divided into ten mini/major kingdoms, that are self-governed. Alethkar is the largest kingdom on Roshar, and where most our main characters come from. There is a battle going on for all of Roshar. The Parshendi, who live in the middle of the Shattered Plains, are being led by some ancient beings to gain more land and to free their enslaved relatives. They also have war waged on them for assassinating a king. The Stormlight Archive world is unlike anything else in literature. First off, unforgiving Highstorms are constantly happening around the world of Roshar. Highstorms provide Stormlight, which is an energy that the people keep in different gemstones, which have a super vast array of different uses. And because this story surrounds wars on many different fronts, it makes sense that these Highstorms also help power some pretty powerful and unique weapons, armor, and even some magical companions. 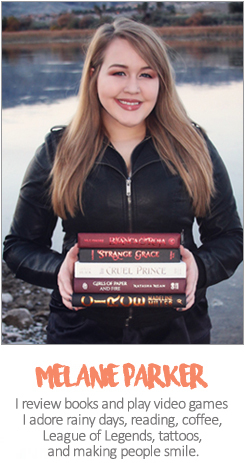 We mostly follow three main characters, even though these books have extremely large casts! Each of the characters you’ll be introduced to, you’ll easily love, or easily love to hate. These are some of the best and most fleshed out characters I’ve ever read. ➽Dalinar – This whole series truly starts when Dalinar’s brother, the King himself, is murdered in cold blood. Dalinar is also a Highprince of Alethkar. Dalinar has struggled throughout all of these books, trying to remember a past that is too dark for him to remember. In my very humble opinion, Oathbringer is Dalinar’s book. Him and his family are truly the focal point, and Dalinars character arch, both past and present, made me feel more emotions than I have words for. ➽Kaladin – Once an apprentice surgeon, once a solider, once a slave, once a head guard, always a natural born leader, but now… so much more. Kaladin’s story has been such a beautiful story to watch unfold, and I know it’s nowhere close to being done. Kaladin has very much struggled with his self-worth, but I think he is truly starting to realize how much he belongs, and how sometimes it is worth it to take a chance, even if you’ve regretted it in the past. Also, if I don’t see a flute being played anytime soon… I’m going to explode with anticipation. ➽Shallan – My feminist icon cinnamon roll. I will never understand people who say that Brandon Sanderson cannot write female characters. Shallan, and her journey, is one of the most inspiring things in this entire series. She is daughter of a recently deceased Brightlord. Then, studied under Jasnah Kholin, Dalinar’s niece. She will forever and always be an artist. And she is constantly growing more and more with her powers and as a person. On top of all this, I love the representation she shows/gives as an abuse survivor. And even though I personally feel like these are the main three, there are so many amazing characters in this world. Jasnah is forever and always my queen. Adolin has completely stolen my heart in every way imaginable. Syl is everything I’ve ever wanted in literature, but I probably don’t deserve her. Pattern made me cry from laughing probably about 20 times with “NO MATING!” Hoid is probably going to end up my favorite character in all of literature, or at least the Cosmere. And I’ll forever be begging for more Szeth chapters, because no amount will ever be enough. The heart of this story is oppression, but Oathbringer really focuses on what happens when you realize you’ve been the one oppressing on lands that you thought were your own. Some pretty heavy parallels to our world, if I do say so myself. The bones of this story are religion, and what people from all walks of life are willing to do in the name of their God(s). I’ve said this in many reviews, but religion is equally the best and worst thing in this world. Religion can bring love, and acceptance, and peace, but never has a war been fought that hasn’t somehow been about religion. Brandon Sanderson is a very religious man, but the way he writes about people who choose not to believe is so wonderfully done. The theme of this story is and always will ultimately be love. The love of lovers, the love of family, the love of friends, the love of ourselves, the love of clans, the love of our soldiers, the love of our God(s). 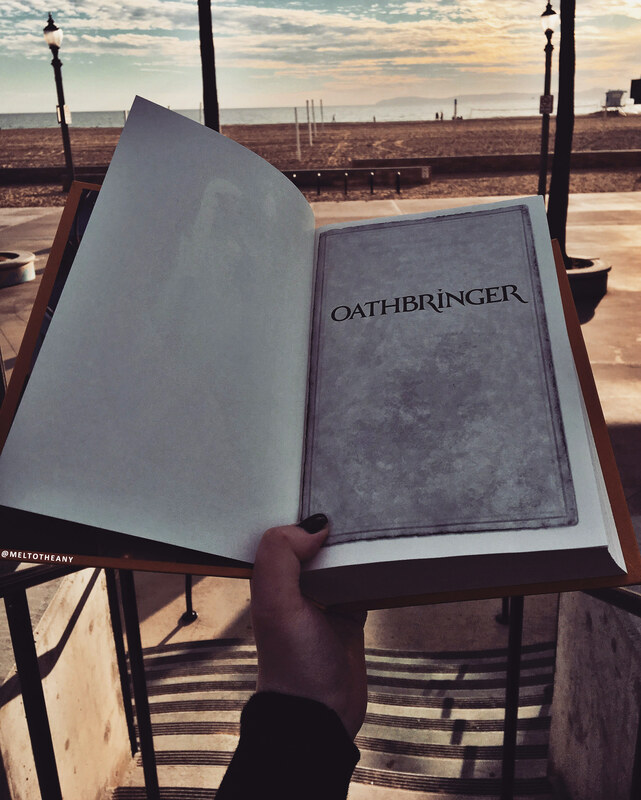 Oathbringer truly feels like a love letter to found families and how true, unconditional love can change the world, always. Like, I know that sounds somewhat corny for this epic fantasy series, but it’s the damn truth. Love will always be the biggest driving force, and this is proven time and time again in this series, but truly highlighted in Oathbringer. I know Brandon Sanderson gets a lot of hate for a ten-year-old, ignorant statement he made. And I’ll never defend or make excuses for what he said; it was wrong, but I do believe he has changed his views and no longer feels/thinks like that. As for the representation in this book, Oathbringer has a m/m relationship that warms my heart so very much! We also get a POV from a disabled woman who is in a wheelchair, who also happens to have the best bird companion ever. And this book heavily deals with grief and trauma. Dalinar, in my opinion, very much is living with PTSD and we find out a lot about his past in this book. You know, the past he desperately wanted to never remember. My heart broke for him over and over in this book, but I think the portrayal of his grief was expertly done and it meant a lot to me. Brandon Sanderson has also stated that Renarin is on the autism spectrum, which is awesome representation we rarely see in high fantasy. Content warnings for severe depression, suicide, war themes, physical abuse, mental abuse, emotional abuse, violence, murder, and gore. This is a very heavy book, that doesn’t shy away from brutal things, and that constantly talks about wars, and duels, and battles. Please, use caution if these things are not for you. I finished this book on Christmas day, and I couldn’t have asked for a better gift. This series just brings me so much love and joy. I honestly feel like it is Brandon Sanderson’s best work to date, and I’m not sure how I’m going to be able to wait until the next installment. I truly believe this is a once in a lifetime series, and I feel so blessed to be able to experience it. Perfection. I didn’t read the review after the first praising paragraph because I don’t want to know anything about this beautiful series. I want to feel it all myself when I finally get around to reading it. I keep thinking, though, that I should wait until the baby comes in May and read it at night when the baby is hungry…. still that is a long way away! Someone said to start with the most born series… which one do you recommend? And probably Mistborn, just to make sure you like the writing and style…. because these are “less forgiving”. Thank you!! It was one of my 2017 most anticipated books, sadly that makes it even worse that I haven’t touched it yet. This is the second outstanding review of a Brandon Sanderson book I’ve seen in two days. Maybe it’s a sign I need to dig the one out of my TBR and get started. Finishing this one up now. Taking my time because I’m not ready to be all caught up on this series. At least I have a few other Cosmere novels to get to. I love this series I was waiting very impatiently for it to come out!